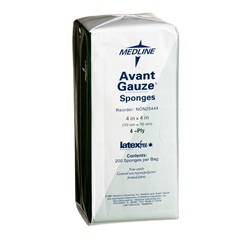 Gauze Pads - Medline 4 Ply, 4" x 4"
Non-sterile Avant Deluxe gauze sponges made from 4 ply rayon and polyester. Measures 4" x 4" and is manufactured by Medline. Latex free. Comes in a sleeve of 200. Deluxe line of non-woven sponges that are a unique rayon and polyester blend to provide improved strength and absorbency. 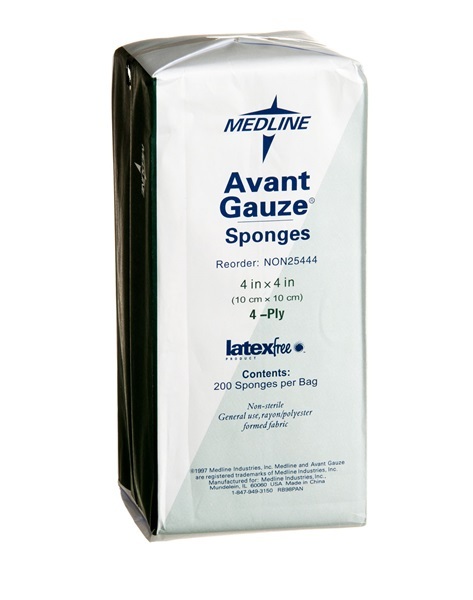 The increased material weight helps provide a more efficient sponge than our traditional Avant line by reducing the number of sponges that have to used for each procedure. These non-woven sponges provide increased wicking ability as well as less lint versus the traditional woven sponges.